As a Belizean-American woman who identifies as Black, I make it my duty to seek out empowering spaces, activities, and events, for women and girls. I always welcome the opportunity for verbal exchange, as I see it as a form of self-care. 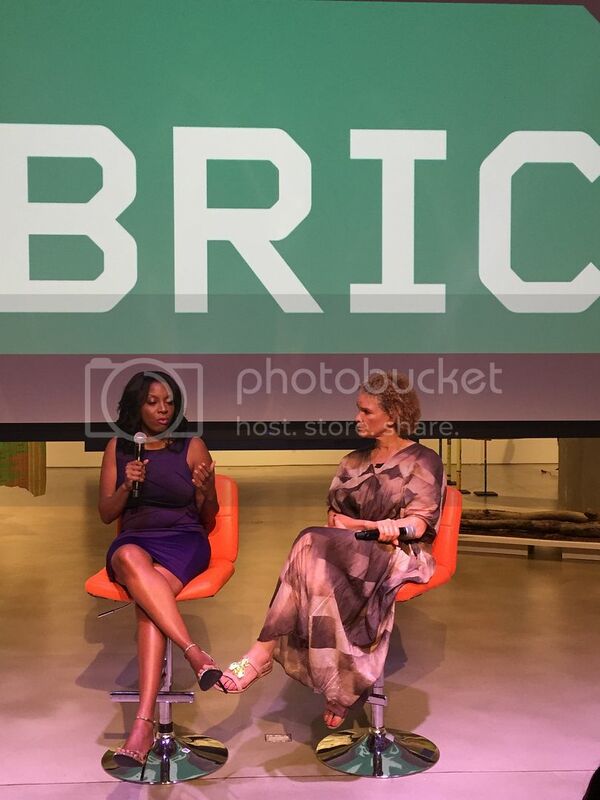 While browsing the BRIC website, the leading presenter of free cultural programming in Brooklyn, I was excited to see a free event on the calendar entitled, Bridge to Brilliance: Nadia Lopez in Conversation with Michaela Angela Davis. As coins are a bit low for me, the FREE was a huge draw, but the women featured were most important. By now, you should be familiar with Dr. Nadia Lopez, the Principal at Mott Hall Bridges Academy in Brownsville, Brooklyn. Her story became viral via popular Instagram account & blog, Humans of New York, when her student Vidal, mentioned to Brandon that she was the person who has influenced him the most. The conversation, moderated by CNN contributor and image activist Michaela angela Davis was to serve as the release event of Lopez’s book, BRIDGE TO BRILLIANCE: How One Principal in a Tough Community is Inspiring the World. I purchased my copy of the book prior to the event as I figured the inspiring story would help lift my spirits, and help me get out of the “I’m 30 and I have no idea what I am doing with my life” rut. The event, held on the evening of Tuesday, September 20th, took place on “The Stoop” at BRIC, where many public community events are held. At 7 PM, introductions were made, and we began the night watching Dr. Lopez’s TED Talk “Why open a school? To close a prison”, which was filmed in November 2015. The ideal of the Black woman as a superhero was a central theme; she takes care of everyone around her, giving all she can, and making something out of nothing on a daily basis, but who takes care of her? As a fellow Brooklyn girl, and child of parents who have worked in, and continue to work in NYC Public Schools, I can completely relate to your story. Starting your own school is an idea that may be farfetched to some. What advice would you give to young girls & women who have farfetched ideas for their career or future businesses? This is a question I not only ask for myself, as I believe I am still in the process of “figuring it out”, but also every young woman out there that is in need of a bit of inspiration. Book signing was the final chapter, no pun intended, of the evening and I made sure to move swiftly to the front of the line as I had purchased my book earlier in the day. I was about fourth or fifth in line, and when I got to the front, I made sure to tell a bit of my story. I mentioned my parents working in public school, and I thanked her for everything she does, and gave her a hug. Instead of rushing out of the building to go home, I wandered around the space, taking a gander at the art on view. I felt so motivated, empowered, and full of love at the end of the night. Was this the impetus of change for me, and my life? We shall wait and see. In the meantime, make sure to check out the BRIC website for upcoming talks, art exhibitions, and live music.